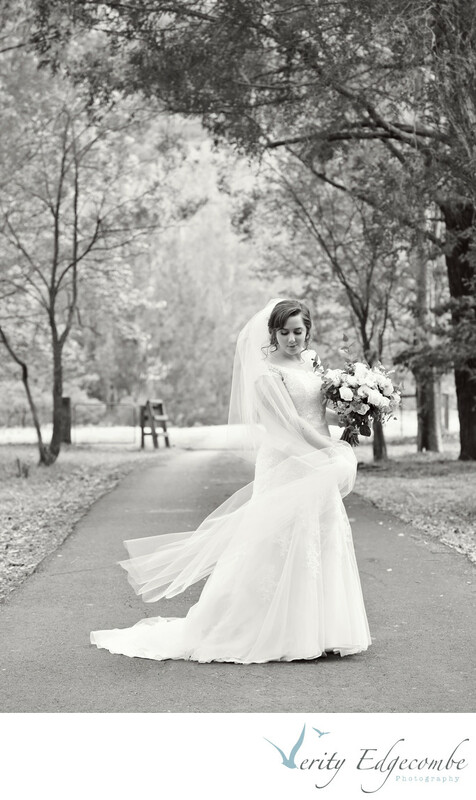 It is said that a bride looks her finest on her wedding day and that is often true. She has spent a lot of time, often years, preparing for the happiest day of her life and she wants her partner to be swept off their feet! Special attention has gone into her hair, her make-up, her nails. She has spent more money on that one dress for her wedding day than all the dresses in her wardrobe put together! Choosing a photographer that can capture that beauty is important. A lot of brides are often quite tense when I arrive at their pre-wedding venue so I keep things calm and listen to what my brides needs are. Some brides need a few minutes to themselves before they get into their wedding car. Other brides need assurance that they look beautiful and they will bowl everyone over as they walk down the aisle! This photograph is of a bride who stayed in a cottage near her wedding the night before. We were able to get some gorgeous bridal portraits, some photos with her parents and others with her bridesmaids before the ceremony. Because she had chosen such a beautiful country cottage to stay in with large expanses of open space we were able to achieve this photo with a lot of depth to it including the trees well into the distance. There are so many difference tones in this photo and I do look for this situation as much as I can so you can have that almost ethereal look to your wedding photos. I love movement in photos and Jo, the bride, was very good as swishing that veil and gown, creating one of my favourite bridal portraits for the year! Should or shouldn't I have a veil? Veils are only worn by brides...or little girls dreaming of being brides! They can be heavy and annoying and even get a bit hot but there's normally only one chance in life to wear a veil so, why not! They add a beautiful element to your look, can be a bonus for brides who want their arms covered or softened and add that touch of mystique for the groom before the veil is removed - generally for the kiss! Some brides choose to take their veils off after the ceremony, which is ok but if you like your veil, don't forget to get a few bride and groom portraits with the veil as they are often beautiful, especially if the wind catches the veil just a little and adds some more natural movement.